Lemonade Stand Economics author, Geoff White, understands the importance of entrepreneurial education, which is why he’d like to donate a portion of his book’s proceeds to NFIB’s Young Entrepreneur Foundation. Give students a plan to pay for college without needing student loans. Sitting in the financial aid office at freshman orientation is not the time to start planning how you are going to pay for college. Lemonade Stand Economics is that plan. Educate students in financial literacy. Financial literacy standards are written right into Lemonade Stand Economics making it useful in the classroom. High schools introduce students to the basics of money management, but Lemonade Stand Economics takes it to another level by teaching students the importance of planning for their financial future, budgeting, setting financial goals and how debt impacts them after graduation. Teach students skills that will benefit them for the rest of their lives regardless of where their career path takes them. Even more important than the money students make working for themselves, is the real world education they receive. Time management, money management, how to market yourself, workplace etiquette, overcoming fear and handling rejection along with the importance of budgeting and the pain of debt. Real issues that are better learned during high school then after college. Help students realize that paying for college is easier than you think. Lemonade Stand Economics teaches high school students how to work for themselves and graduate from college without student loans. Learn to make $15, $20 or even $50 per hour working for yourself and pay for college one semester at a time. It’s not hard if you know what to do, but that’s the problem. As a high school student you just don’t know where to start. 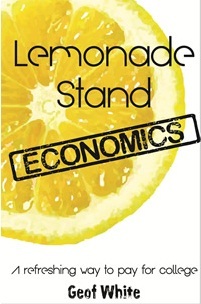 Lemonade Stand Economics shows you what you do…and where to start. The typical college student graduates with $26,000 in student loans. The typical college graduate takes over 17 years to pay off their student loans. You don’t have to be typical! With a good plan you can pay for college without student loans or money from your parents. Lemonade Stand Economics will teach you how to set goals, budget, advertise, market, price jobs, and serve up a steamin’ hot plate of fantastic customer service. Once in this money making rhythm you will make enough to pay for college and graduate with no debt. Geof White is an NFIB member who began working at the age of 14 for $3.35 an hour. When he graduated from high school four years later, he was earning $50/hour and paid for his college degree from Michigan State University by working for himself cleaning windows. As a teenager he marketed, advertised, and provided the best customer service he could to every customer. After graduating from college, he worked for ten years as an employee…putting profits in other people’s pockets. Now Geof runs his businesses putting the profits in his own pocket. In the past 10 years Geof’s businesses have provided employment to over 30 families and experienced double digit growth in challenging economy.